Indigo Figs Zone Stamp is a cell-based zone stamp whose size and location for each cell can be adjusted. There are major changes in the core parameters for Indigo Figs Zone Stamp 22 version 2.00. No migration script is provided. It is recommended to start a new project with it. Using it with on-going project that contains the previous version of Zone Stamp requires user to recreate/redefine all existing Zone Stamp instances. According to Graphisoft GDL Standards, there is no migration available for Model View Options/Combinations. When upgrading to the newer version of ArchiCad, user will need to recreate/redefine all the settings for Model View Combinations again, if used. 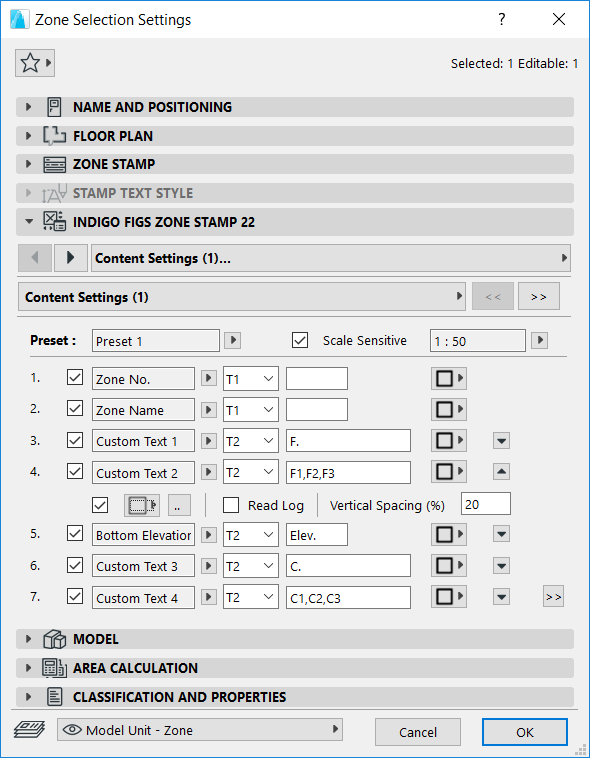 Uniform Text Settings (Font, Size, Alignment, …) apply selected options to all Text’s settings for specific style (T1, T2, T3) through all scale sensitivities. All contents (Zone Parameters, Custom Text, Properties, …) are now merged in one list. There is no need to switch between tabs to select different contents. “Elevations”, “Category”, “Category Code” and “Zone ID” were moved into the new “Extended Parameter” section. Cell’s content is now scale sensitive. Each cell can show different contents for each scale. Works better with rotated view. Zone Stamp, Text and Pointer are automatically rotated according to view rotating angle (with “Angle Fixed to Model” option selected in “Zone Stamp” tab in “Zone Selection Settings”). Newly “Show” cell will be placed at the bottom left of the Zone Stamp. Pointer’s anchor is automatically adjusted when anchor’s angle is changed. Table Frame’s pen doesn’t use the correct pen when “Draw Table Frame” option is disabled. Model View ID affects cell’s position/size for any active Model View Combination. Model View Combinations with the same Model View ID share cell’s position/size. To avoid confusion, it is recommended that each Model View Combination has different Model View ID. Nevertheless, applying the same Model View ID can be useful when the same format (number of cells, location/size) is needed. Cell’s content can still be different for each Model View Combination. (11 Jul. 2018) An internal update for archive projects.